Asus announce the MeMo Pad 7HD and the FHD 10! Asus has brought their A-game to Computex this year and the first in a flood of announcements from the company was the arrival of some new MeMo Pad (pronounce mee-mo) tablets. The MeMo Pads have always been budget tablets, but this time they're a little bit better than the past generation! Let's start with the 7 inch version first and that device has a relatively slim 10.8mm thick profile and it weighs in at a respectable 302g. The good stuff though is that there is a 7-inch 1280 x 800 IPS display, a Cortex A7 quad-core CPU will drive the device and PocketLint believe it's a Qualcomm SoC. This processor will be paired with 1GB RAM,a 1.2-megapixel front-facing camera and a 5-megapixel camera on the rear. The MeMO Pad HD 7 has 16GB of internal storage and can be expanded via a microSD card slot. Asus are also offering 16GB of Asus WebStorage that's free for one year. Asus have said that the battery is good enough for 10 hours on a single charge and they're not normally too far off, so that's great to hear! Unfortunately, this device is designed for emerging markets so it will have to make do with the slightly ageing Android 4.0 ICS to begin with, which is a shame. The 10 inch device, the MeMO Pad FHD 10, is what got us more excited htough and you can think of it as a competitor to Samsung Galaxy Tab 3 10.1, although we expect this one will be slightly more expensive. The device is 9.5mm thick and 580g in weight. Inside that shell is a snappy new dual-core Intel Atom Z2560 1.6GHz processor, a great 1920 x 1200 better than full HD IPS display and ASUS have thrown in their SonicMaster audio technology. There will also be 1080p video playback and recording through the pair of cameras, which are 1.2 MP and 5MP on the front and rear respectively. 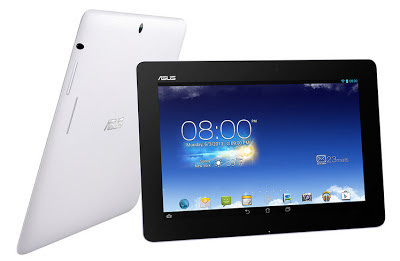 There's all the normal connections you would expect from this sort of tablet, as well as 16GB or 32GB of internal storage, which is microSD expandable and Asus are offering 5GB of Asus WebStorage with this device. This time, thankfully, there's Android 4.2 on board and this will be a much higher end tablet than its little brother with supposed 178 degree viewing angles from that better than full HD display! The MeMO Pad HD 7 will start at $129 (£85) if you want the 8GB option and the 16GB will be $20 more when the device lands this coming July! $149 for 16GB when it goes on sale in July. The bigger 10 inch tablet though will only come to market in September, but it will come in Royal Blue, Silk White and Vivid Pink! The full press release is available below! Computex Taipei, Taiwan (3 June, 2013) - ASUS today announced the new MeMO PadTMTM HD 7 and MeMO PadTM FHD 10 Android tablets. With an MSRP of just US$ 129 for 8G and US$149 for 16G, the MeMO PadTM HD 7 is a 7-inch tablet that offers incredible value, with a quad-core processor, 1280 x 800 IPS display, and 1.2-megapixel front and optional 5-megapixel rear cameras. MeMO PadTM FHD 10 is a 10-inch tablet with the new Intel® Atom™ Z2560 processor, 1920 x 1200 Full HD IPS display and ASUS SonicMaster audio technology. 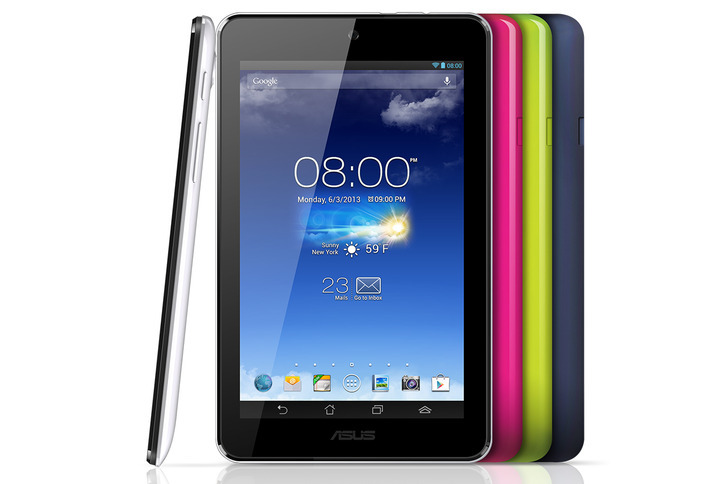 ASUS MeMO PadTM HD 7 has a quad-core processor and 1GB RAM for smooth and responsive performance with apps of all kinds. The 7-inch display has a 1280 x 800 native resolution for crisp text and images, and IPS technology for accurate, vibrant colors with 170-degree wide viewing angles. MeMO PadTM HD 7 also features high-quality stereo speakers with enhanced sound, courtesy of ASUS SonicMaster audio technology. ASUS MeMO PadTM HD 7 has a 1.2-megapixel front-facing HD camera that can capture 720p HD videos and models are also available with a rear 5-megapixel camera. Just 10.8mm thick and 302g, the feature-packed MeMO PadTM HD 7 has a lithium polymer battery that lasts for up to 10 hours with 720p video playback. Models are available in four colors - black, white, pink and green. MeMO PadTM HD 7 has 16GB of storage and a MicroSD card slot, plus 16GB ASUS WebStorage free for one year. Together with the ASUS WebStorage Office, users can view, create, edit and share Microsoft Office documents online. ASUS MeMO PadTM FHD 10 features the latest Intel® Atom™ Z2560 1.6GHz processor and a 1920 x 1200 Full HD IPS display for deliver vivid visuals with 178-degree wide viewing angles. MeMO PadTM FHD 10 has stereo speakers with SonicMaster audio technology and its 10-inch screen makes it ideal for entertainment, 1080p video playback and handheld gaming. MeMO PadTM FHD 10 features Intel® Hyper-Threading Technology for improved graphics performance and increased energy efficiency. The slim design has a 1.2-megapixel front-facing camera and a 5-megapixel rear-facing camera with autofocus for impressive photos and 1080p video recording. ASUS MeMO PadTM FHD 10 is just 9.5mm thick and 580g light, and its lithium polymer battery lasts for up to 10 hours with 720p video playback. The 'micro-weave finish' is available in Royal Blue, Silk White, and Vivid Pink. MeMO PadTM FHD 10 has full connectivity options, including 802.11a/b/g/n, GPS and GLONASS navigation. ASUS Miracast wirelessly connects the tablet to a Wi-Fi enabled TV or projector to share movies, photos and presentations. MeMO PadTM FHD 10 is available with 16GB or 32GB storage and both capacities also feature a microSD card slot. 5GB of free lifetime ASUS WebStorage is also included. Both MeMO PadTM HD 7 and MeMO PadTM FHD 10 come include a protective TransCover with microfiber interior. TransCover folds into a stand to prop up the tablet at the perfect angles for watching video and typing with the on-screen keyboard. TransCover is available in blue, pink, white and black for the MeMO PadTM HD 7; and black, pink and green for the MeMO PadTM FHD 10. The Persona Cover for the MeMO PadTM HD 7 is also available. Available in black, pink and green, this is a snug-fit case that protects the tablet from everyday bumps and scrapes. ASUS MeMO PadTM HD 7 has an MSRP of US$ 129 for 8G and US$149 for 16G and will be available starting in July 2013. Please contact your local ASUS representative for further information. Could this be the HTC One Mini? Samsung officially announce the Galaxy S4 Active! Toshiba announce a trio of Android tablets! Acer announce the Liquid S1 'phablet'. Samsung announce the Galaxy Tab 3 8-inch!